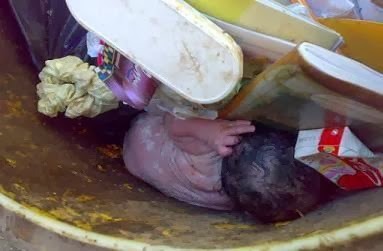 A lifeless foetus was found inside a bucket at the Hall Eight Female Hostel of the University of Calabar. The identity of the female student, who abandoned the foetus beside one of the bathrooms, is still unknown. A female student, who craved anonymity, said her attention was drawn to the foetus when she saw others running towards a particular direction in the hostel. The source estimated the pregnancy to be about five months old. “From the size of the foetus, it should be about five months old. The unfortunate thing is that nobody knows who did it, at least for now, but I am sure that the person is in this hall,” she said. When PUNCH Metro visited the scene around 4pm, female students were seen discussing the matter in hushed tones, and not willing to divulge any information. But another source, who also pleaded anonymity, disclosed that the dead baby was taken away to an unknown destination by some hostel officials. Another source said the foetus had been secretly buried. When contacted, the university Vice-Chancellor, Prof James Epoke, confirmed the incident. He said, “Yes, I have the report, but the identity of the student is not yet known. We cannot monitor how they live their private life. If she had even come out to tell the school authority that she was pregnant, we might have granted her maternity leave and she continues her education when she comes back after delivery.